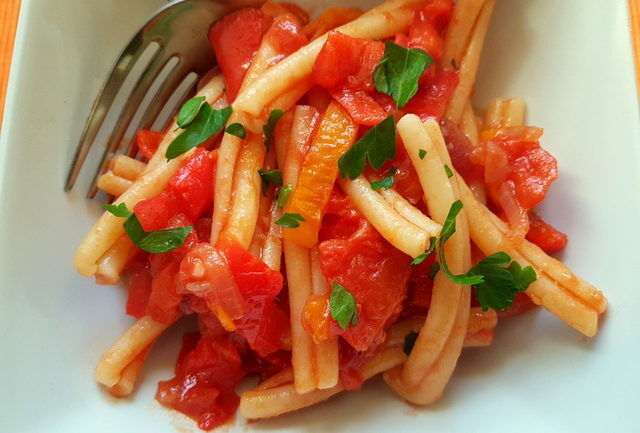 Casarecce Pasta alla Peperonata (sweet pepper sauce); Southern Italian Recipe. The star of this seriously tasty casarecce pasta alla peperonata is a stewed sweet pepper sauce that’s very traditional in Southern Italy. Peperonata can also be eaten as a side dish or on bruschetta. Peperonata is a vegetarian Mediterranean recipe based on sweet peppers (capsicums) stewed in a pan with garlic, onions and tomato sauce. 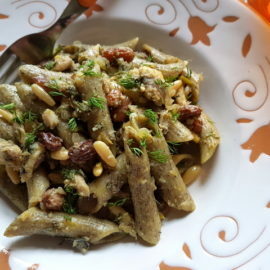 This is a typical Southern Italian recipe, originally from Sicily, Calabria and Campania. But, it is eaten in many other parts of the Italian peninsula. Peperonata is traditionally a summer dish, since sweet peppers are in season in Italy from June to September. 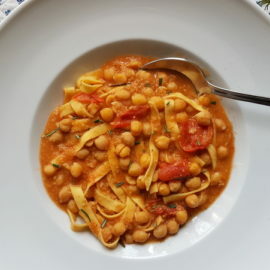 Like many Southern Italian recipes, this is a simple uncomplicated dish made with seasonal ingredients that have bold flavours brought out by the way they are cooked. 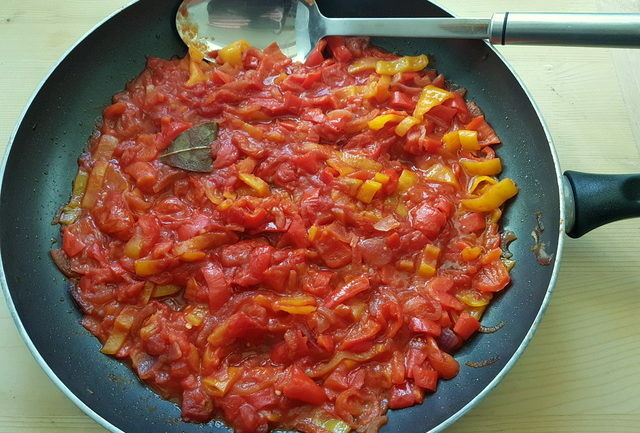 Many Italians prefer to eat peperonata cold and, as is often the case with stewed dishes, it is even better eaten the next day. Italians eat peperonata as a side dish with both meat and fish, but also on bruschetta or on pasta, like in this casarecce pasta all peperonata. I think eating it with pasta is my favourite way to have it! When buying peppers for this pasta alla peperonata choose medium-sized and firm ones. They are usually sweeter. Also, look out for the orange ones. Those are the sweetest of all. 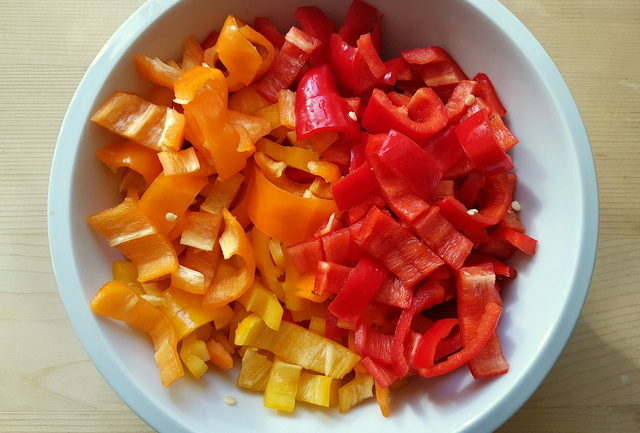 Some people include green peppers but, I prefer the red, yellow and orange ones. You can also just use red ones. In addition, if you can find them, use Tropea red onions from Calabria. These are more delicate than other onions. If not, red onions are best or shallots. This casarecce pasta alla peperonata is made with a classic peperonata. This is a very simple and reasonably fast sauce. However, simple and fast doesn’t mean bland. This is really tasty! Every region, or even every town, in Southern Italy has its own recipe for stewed sweet peppers. For example, one version in some areas of Sicily includes breadcrumbs, which are added just before the sauce is ready. 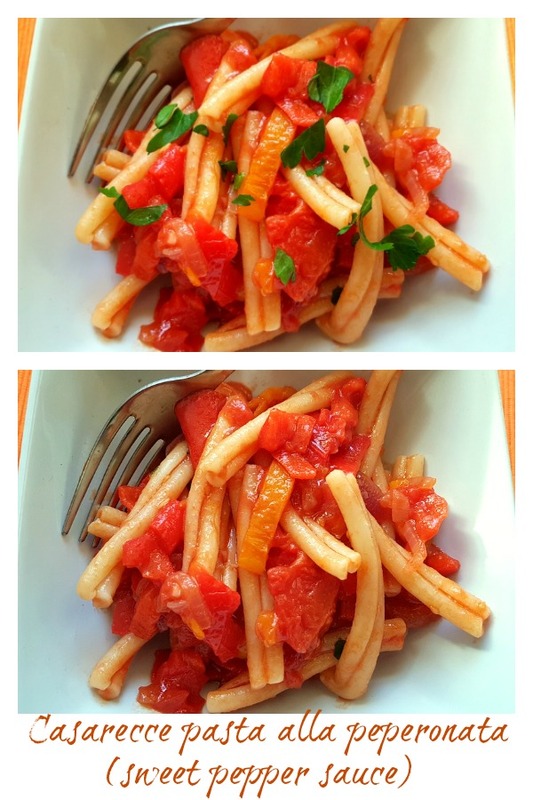 I served this pasta alla peperonata with casarecce pasta from Gragnano. This is a traditional short pasta originally from Sicily but popular throughout Southern Italy. 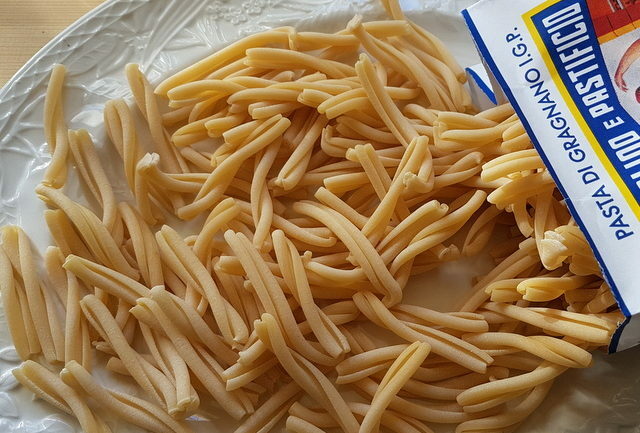 Casarecce are short pasta noodles with curled edges and a groove down the middle. They look a bit like little rolled up scrolls. You can read more about casarecce if you click here. I used this pasta because it’s typical Southern Italian and goes really well with the sweet pepper sauce. However, you can use any type of pasta. I would recommend short pasta like penne, cavatelli, orecchiette or rigatoni. Making casarecce pasta alla peperonata is simple. Just gently fry the onions, garlic and pepper strips until they start to soften. Then add tomatoes and passata and a little wine vinegar and simmer covered for about 30 minutes until the peppers are really soft and everything has come together in a rich stew. While the peppers are cooking you can boil the water for the pasta and cook it. Add the drained pasta to the ready sauce and serve with grated cheese and some parsley or basil if you like. 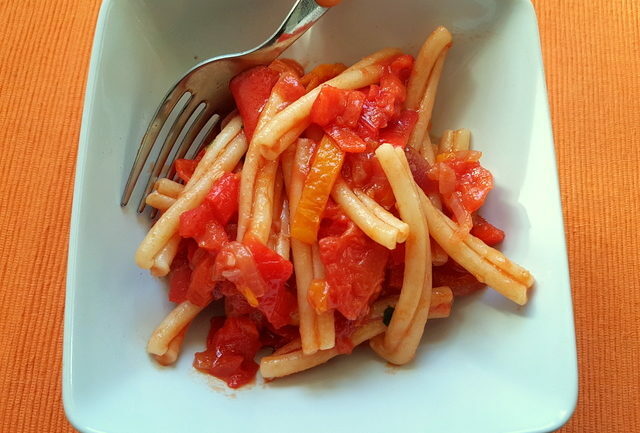 If you do try this casarecce alla peperonata recipe, I’d love to hear what you think. Please write a comment here on the blog or post a comment on the Pasta Project Facebook page. Peperonata can also be served as a side dish or on bruschetta! Stewed sweet peppers are the star of this Southern Italian peperonata pasta recipe. In Italy, this sauce can be served with pasta or as a side dish. It's simple to make and full of flavour. Wash and dry the peppers well,. Cut them in half lengthwise and remove the stalk with seeds and internal white filaments. Cut the peppers into smallish strips. Wash the cherry tomatoes, dry them and cut them in half. Peel the onions and slice (not too finely). Peel the garlic. 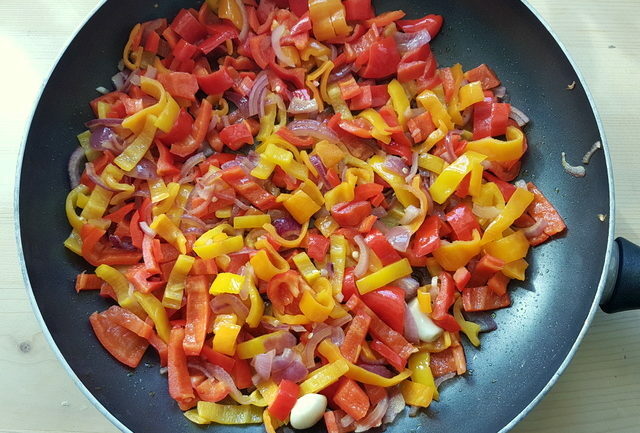 Put the extra virgin olive oil into a deep frying pan or skillet and add the onions , garlic cloves and peppers. Cook over a medium heat until all the ingredients start to soften. Stir often. While the pepper sauce is cooking, put a pot of water on to boil for the pasta. Add salt once it starts to boil and bring to the boil again. Cook the pasta al dente according to the instructions on the packet. Before draining the pasta save a cup of the cooking water. Remove the bay leaf from the sauce. 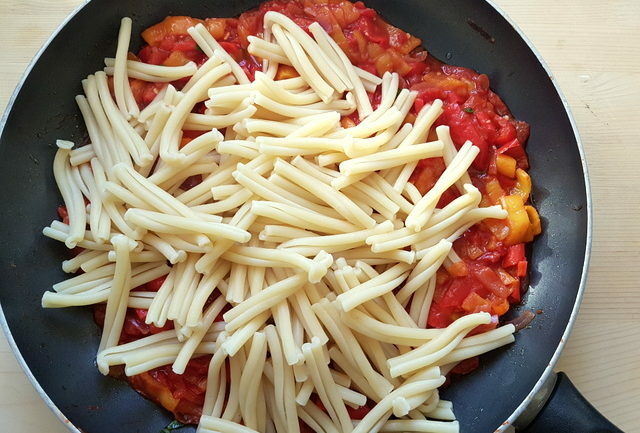 Add the drained pasta to the peperonata and mix together well. If the sauce seems dry add some of the pasta cooking water. If you make a larger quantity you can save some peperonata to eat as a side dish or on bruschetta. You can also bake the pasta and sauce before serving. Before putting it in the oven, add some grated parmesan or grana on top (or mozzarella) (It’s very good). You can use other pasta for this recipe. I would recommend other typical Southern Italian short pasta like penne, cavatelli, orecchiette or rigatoni. You’ve done it again with this casarecce pasta alla peperonata. I love your foodie tip. I’m sure I would of made this mistake but now I know. This sweet pepper sauce sounds delicious, I can just eat it with French bread , thanks for sharing! All those yummy peppers in one pasta! That sounds so good! I love peppers in pasta and they give an awesome texture- can’t wait to try. Thank you so much! The peppers really have such a good flavour and go so well with pasta! I’m sure you’ll love this dish! When someone says pasta, I imagine a whole universe of options – thanks to your blog! I mean how many types of pasta are there?! My only wish is that you never stop because this Casarecce Pasta is just unbelievable! Aww thanks so much Mimi, There are hundreds of different types of pasta here in Italy. Some say over 360 others think more than 400! So, tons more typea of pasta to post about and lots of delicious recipes for them! I love how you put a special focus on the sauce just as much you do on pasta. I have always believed that sauces make the dish + it is incredibly interesting to find out the background of each sauce (and pasta) in each of your recipes. Fantastic post! Thanks so much dear April! 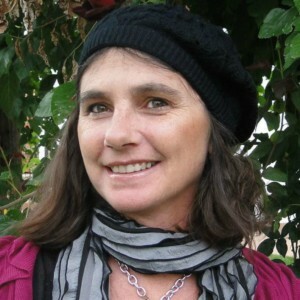 I’m thrilled you like my recipes and the info I include! I love learning about and trying these pasta dishes and sharing them with others! My mouth is watering for this sweet pepper sauce! perfect with the pasta for an easy and delicious dinner! I will make a double batch, I want some for lunch too! Thank you Eileen! 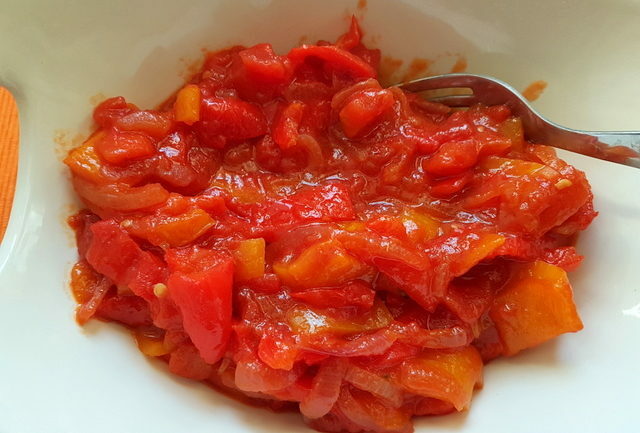 This sweet pepper sauce is really mouth-watering! You can also eat it as a side dish or on bruschetta! So delicious! I love all the pretty colors going on in this dish. Looks so fresh tasting. Can’t wait to try this one! I’m sure you’ll love this pasta recipe Amanda! 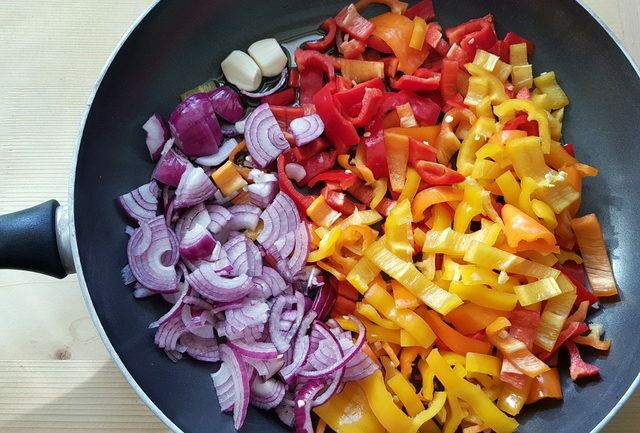 The peppers make it both colourful and flavourful! A real winner! Thanks Lathiya! This sweet papper sauce is wonderful! You can use other types of pasta or even eat it as a side dish! That sweet pepper sauce sounds delicious and really easy to make too. It looks like a fresh and summery pasta dish. And I’d love to try it on bruschetta too, yum! I am sure you’ll love this peperonata Stine! It is so flavourful and great with pasta or on bruschetta! I would love to visit Italy….just for the food alone. You can never go wrong with a great pasta dish. This looks delicious. All we need is a nice bottle of wine, and this would be perfect for a weekend date night dinner. Italy is definitely a foodie heaven Gloria! I hope you’ll get to visit one day soon! Yes this is a great date night recipe. Quite easy to make but really full of flavour and looks beautiful too! Sweet Pepper Sauce sounds so delicious right now! I would love to have some right now and I love that it can be enjoyed cold! Thank you for sharing! So glad you like this recipe Juli! This sweet pepper peperonata is seriously delicious and, yes, can be enjoyed cold as a side dish or with bread too! This is a great twist on classic Sunday dinner, I can’t wait to try it! Thank you Morgan! I’m sure you’ll love pasta alla peperonata when you try it! So delicious! The pasta project – finally, something I can get totally excited about! I just tried this recipe at home. Although I didn’t have any of those pasta shapes, I used just regular penne pasta and it was delicious! I followed the recipe exactly and now you have a faithful reader. I can’t wait to try your other recipes! I’m thrilled you liked this recipe so much Byron! I think penne is a good pasta choice too! Do let me know what you think of any other recipes you try! All the best from Verona! 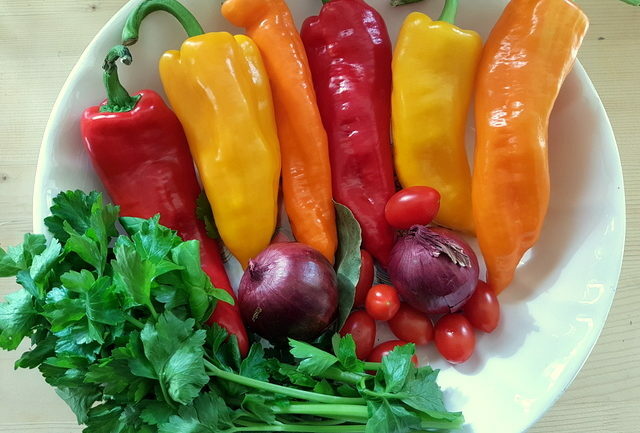 Love your photos of those colorful peppers! This sounds like such a wonderful, flavorful pasta dish. I made something similar to this years ago, but your recipe is even better than that one. Delish! I love this, never tasted anything similar to it. Amazing recipe! Wow. Pepperoni means peppers in Italian? I love these sweet peppers. They make everything better in my opinion. I am loving this recipe already yum. Thanks so much Chichi! Yes peperoni with one ‘p’ is peppers in Italian, not spicy sausage! I love using sweet peppers both with pasta and in other dishes. They are so flavourful! How interesting! I’ve never had casarecce pasta before but it looks delicious. Can’t wait to try this recipe. Grazie Emily! Casarecce is a typical Southern Italian pasta. Luckily nowadays lots of pasta makers produce it so you should be able to find some and try it. 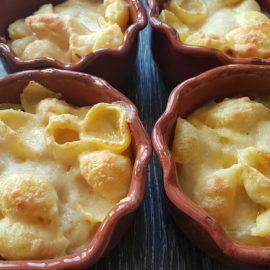 Of course this recipe can be made with other types of pasta too! This dish looks so simple, fresh, and flavourful, and a nice change from tomato based sauces. Can’t wait to try it! Thank you Colleen! Yes this sauce is a great alternative to a tomato based sauce. I’m sure you’ll love it! I love all the bell peppers you used in the sauce. This looks so delicious and that pasta is one of my favorites to eat! Thanks so much Elaine! 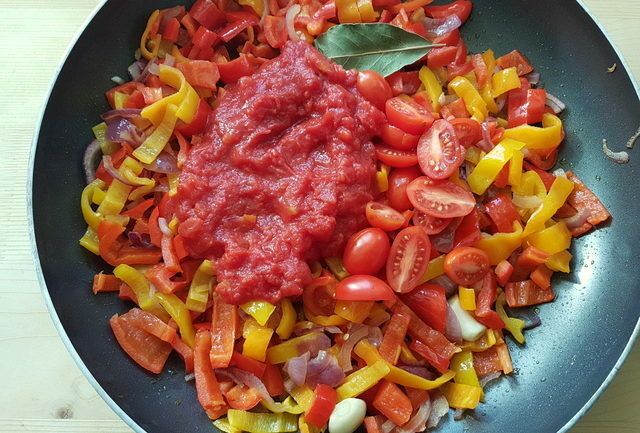 This bell pepper sauce is really yummy and goes so well with the casarecce pasta! A great pairing! I absolutely LOVE peperonata! One of my favorites, with all this peppers slowly cooked. This is great with the onion and tossed with pasta. So perfect. Thank you dear Mike! I love peperonata too! It’s just so flavourful and yet simple to make! Thanks Kim! This recipe is fabulous in summer and winter! I’m sure you really will want to make it often once you’ve tried it! This sounds fantastic! Looks tasty! This recipe is perfect for me and my family. Thank you! Thank you Mary! I’m sure you will all love this pasta dish! Thanks for the tip! I had no idea peperoni meant peppers in Italian. You’re welcome Julia! At least if you’re ever ordering in a restaurant in Italy, you’ll know ‘peperoni’ isn’t spicy sausage! I love how fresh and simple this is. sweet peppers are so awesome to cook with, their flavor is so delicious. Def a great weeknight meal! Thank you Danielle! Yes sweet peppers really have a wonderful flavour, especially when slow cooked or stewed like in this recipe!